Today is the release of my latest design…..
A little bit of bright fun to add to your Christmas in July stitching and it’s ready for purchase now. This design just adds a sweet, yet quirky take on Christmas, bringing the garden indoors with it’s round bellied Gnoma Claus and Mushmas Trees ! A little bit of easy piecing makes this pattern look difficult (but really it’s not! ), and some easy applique add the finishing Christmassy touches. I’ve loved designing and making this quilt and I’m sure you will too. Just head over to my Craftsy shop where you can purchase your PDF pattern which you can download instantly and begin straight away. A great little lap quilt measuring 60in x 48in (152.5cm x 122cm), you’ll have it made in no time, ready to celebrate Christmas in July. 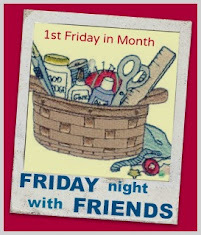 And if you purchase now, you’ll be prepared with something to do for our FNSI - Friday Night Sew In this Friday (signups tomorrow!). that is a cute quilt for sure..
Love those snappy blocks and very spunky gnomes!